This hiking trip was Washington State’s last chance. Its third and final chance. If something terrible happened this time then I swore that I would fly over Washington rather than set foot in it, for the rest of my life. And I meant it. I can be a very stubborn man. Our first trip to the Cascades (back in 2014) had been going great for about a week, until we had a medical issue that forced us to abort the trip via an 18 mile death march lasting an entire night. It was a scary and horrible experience. But we didn’t blame Washington for that. It could have happened in any state. 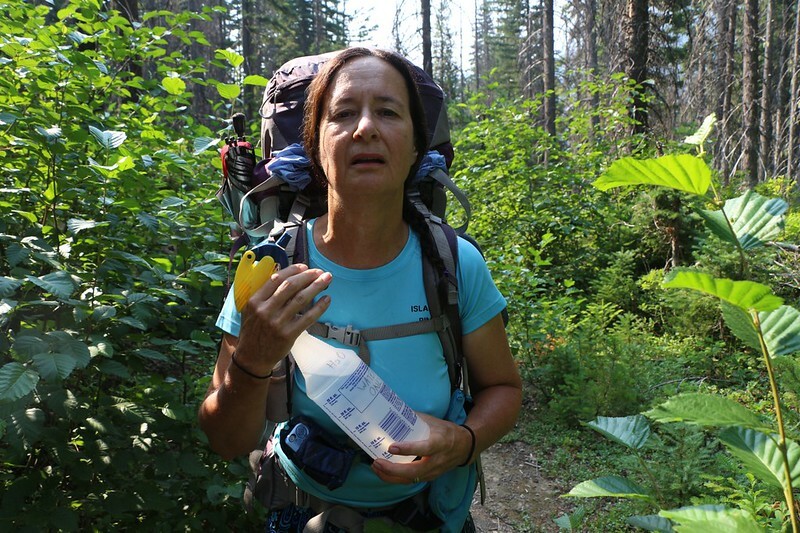 Then we made another trip to Washington two years later, in 2016, but when we got there we discovered that a forest fire had just started and our trailhead was closed to hiking. I scrambled for a backup plan, and decided that we could salvage part of the trip by entering the wilderness at a lower, less desirable trailhead. Sadly, this would mean that the hike would be an out-and-back, rather than a loop hike like we’d originally planned, but it was better than nothing. So we drove six more hours to that new trailhead and started hiking. But it was all for naught. After all that trouble, we only ended up hiking about six miles before we had to call it quits, for yet another medical issue. We turned around and hiked back out. Indeed, the trip was so short and sad that I didn’t even bother to write a post about it here on Hikingtales. We drove two days to get up there, hiked two days, then drove two more days to get home. What a waste! This couldn’t be Washington’s fault, now could it? Surely not. Meanwhile, I was frustrated and angry. Backpacking should be challenging but ultimately enjoyable, not a series of disasters, I reasoned. I had done everything I could to make those trips successful, only to be thwarted at every turn. Therefore, I decided that the State of Washington was going to take the blame for it all, as our treks in the California Sierras and the San Juan Mountains of Colorado had had no problems whatsoever. Rationality had nothing to do with this decision. But there it was, the conclusion written as plain as day in my head. I henceforth decided to restrict our hikes to states that treated us well. And then, a week or so after getting back home last Summer, while I was still fuming about that treacherous state, I read in the news about the Total Solar Eclipse that would be happening the following August. And it would be happening in Oregon. This was a once in a lifetime chance for me! I thought about hiking the appropriate section of the PCT in Oregon, and I did some research, but eventually decided that it would be difficult for us to do it using only one car. And then I thought about the trip we had recently aborted, about how thoroughly I had planned it out, and about how much I really wanted to complete it. Maybe, just maybe, Washington State could be given another chance. Maybe we could do the ten day trek and then hit up the solar eclipse on the way back to San Diego. It would also save me a ton of planning! And so I decided that Washington State would get a temporary reprieve. “Third time pays for all!” I exclaimed. I faced north and brandished my fist in its general direction, vowing to curse it forever if it let me down again. Fast-forward to 2017, and there we were, driving north for two days, pushing our luck, tempting fate, daring to hike in Washington once again. The two-day drive was relatively uneventful. The first day was the longest, with a drive of 15 hours. We left San Diego at 2AM and drove relentlessly all day. Our plan was to camp in the National Forest land just outside of Crater Lake National Park, and on the way we took a voluntary detour in order to avoid smoke inhalation from a fire that was burning just west of Crater Lake. We almost ran out of gas on this detour, and arrived at the dirt road as the sun was setting. 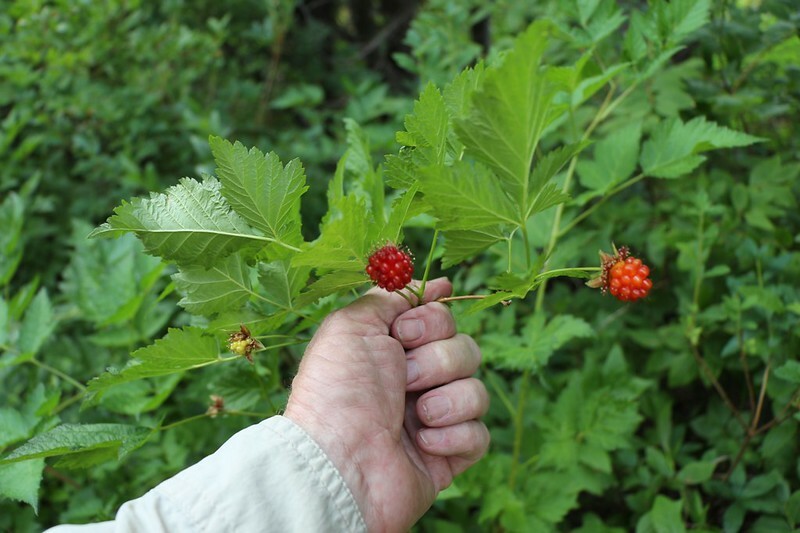 It had just rained (nearly extinguishing the wildfire – hooray!) and everything was damp and smelled great. We had a very peaceful rest that night in the forest. We woke before dawn and packed up the soggy tent, then drove another eight hours north to the town of Leavenworth, Washington and our motel room. Leavenworth is a fun touristy town with a Bavarian theme, and we enjoyed eating sausages for lunch and dinner. Unfortunately, it was hot due to a prolonged heatwave, and the air was smoky due to weather conditions that were funneling smoke down south from forest fires in British Columbia and west from yet more fires in Idaho. There were still no fires where we would be hiking, unlike last year, which was heartening, although the smoky air was limiting visibility in a major way. I was not amused. It looked like Washington was heading for Strike Three. But I wasn’t about to give up that easily. The weather was due to change in a few more days, with rain in the forecast. This was OK with us, as it had rained on us back in 2014 and we’d enjoyed it. It seemed to us that rain should be expected in Washington, and we were prepared. We spread out the soggy tent on the motel’s porch to dry. We went to an outdoor sports store and went shopping. We bought Vicki a new inflatable pillow, but decided that our current raingear was good enough for now. We spent the evening charging our electronics one last time, and enjoyed the air conditioning while we still had it. Once again, just like last year, we woke before dawn and loaded our gear into the car. 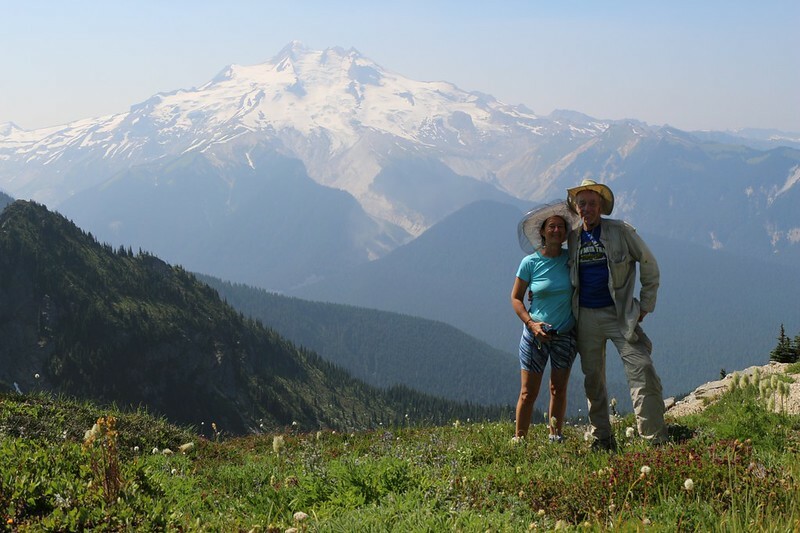 This was it: We were heading out into the Glacier Peak Wilderness on a ten-day backpacking trek, and nothing was going to stop us. We had a great plan, we had great gear, and we had each other. All we needed now was some great scenery. And, this time, Washington didn’t disappoint us. However, the great scenery didn’t begin right away. We had two relatively boring days of hiking to attend to first. And one of those days would be spent travelling through the section of forest that had burned last summer (which caused us so much trouble). But we weren’t worried about that. This was intended to be a loop hike, and we decided to begin our hike on the “ugly” side of the loop and finish on the pretty side. We were simply saving our “dessert” for last. We didn’t want to spend our final day all tired and dirty and exhausted, slogging through a disaster zone. We would end our trek on a high note. We drove north from Leavenworth toward Lake Wenatchee, then continued north on Chiwawa River Road. The road was twenty miles long. It started out paved but eventually deteriorated into a bumpy dirt road. The going was slow, especially in our low-slung sedan, but we didn’t care: We were finally in the forest! It was green and lush and smelled of pine trees. We eventually arrived at the “Trinity” trailhead, where the Buck Creek Trail begins. We parked the car and got out our big packs, then double-checked that we had everything. We shouldered the packs and hiked down the trail about a tenth of a mile, then headed into the forest near a big tree with a red line painted around it. We stashed our packs behind this obvious landmark, then headed back to the car. 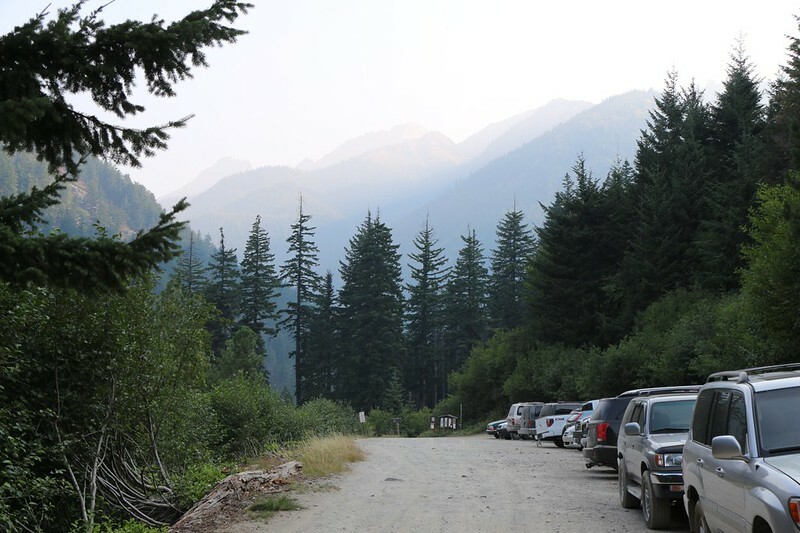 Our plan was to drive to the Phelps Creek Trailhead and drop off the car. Phelps Creek would be where our loop hike would end. It was also uphill from Trinity, up about three miles of long switchbacks, and we had no interest in carrying heavy backpacks on that road. That’s why we stashed them first, so we could day-hike our way back downhill. It took some careful driving but we made it up the hill to the trailhead. We parked the car along the road with all the others, and triple-checked that we had everything. I fired up the GPS and made a waypoint. We put on our hats and locked the car, then began the hike back down the road. My plan was to take a shortcut, bushwhacking directly downhill, thus avoiding the road’s long dusty switchbacks. It was a very steep slope, we discovered. No wonder they made switchbacks! Still, we eventually found a deer trail and headed down, making our own small switchbacks in the process. As it turned out, our way was faster, and we saved at least a mile of boring road-hiking. We made good time, and it was only 9AM when we arrived at the Buck Creek Trailhead. We crossed the bridge over Phelps Creek and recovered our stashed backpacks. Now it was time for the real hike to begin. With ten day’s worth of food, our packs were at their heaviest. Mine was about 65 pounds, a truly insane weight by most people’s standards, but my old external frame backpack made carrying such a load almost tolerable. Vicki’s was about half that heavy, and she wasn’t exactly overjoyed to carry hers either. But we had no choice. The best way to make them lighter was to eat all the food, but we had to hike for days in order to eat it. Catch-22. Naturally, the trail was uphill the whole way from that point on. In fact, it was going to be uphill for two consecutive days, until we reached the top of the valley at Buck Creek Pass. There was a total elevation gain of 3200 feet from Trinity to the Pass, which is way more than Vicki was willing to do in one day. Our goal for today was to hike as far as we possibly could. Whatever was left over would have to be hiked tomorrow. No pressure. We were on vacation, not on a death march, and so we’d simply do our best and try not to kill ourselves. “We’re on vacation” was pretty much our motto for this entire trip. We were trying to give Washington State every chance to make our trip a winner. Just the same, you can’t gain 3200 feet without climbing it one step at a time, and the day was pretty darned hot. We were sweating even at a slow hiking pace, and were glad for the shade of the forest when we could get it. 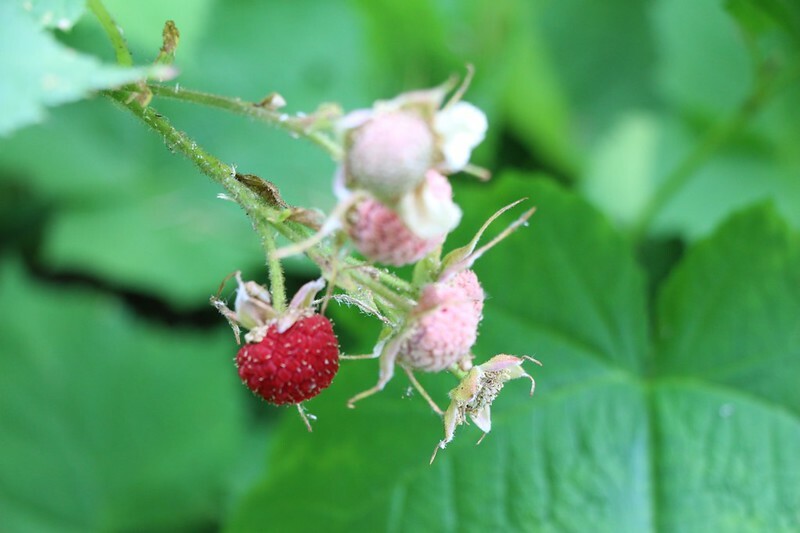 But there were some compensations, like the patches of ripe wild thimbleberries we found alongside the trail. Meanwhile, Vicki used our new weapon against the heat: The squirt bottle. She repeatedly sprayed her legs, arms, face, shirt, and pants with water, and every squirt felt great. 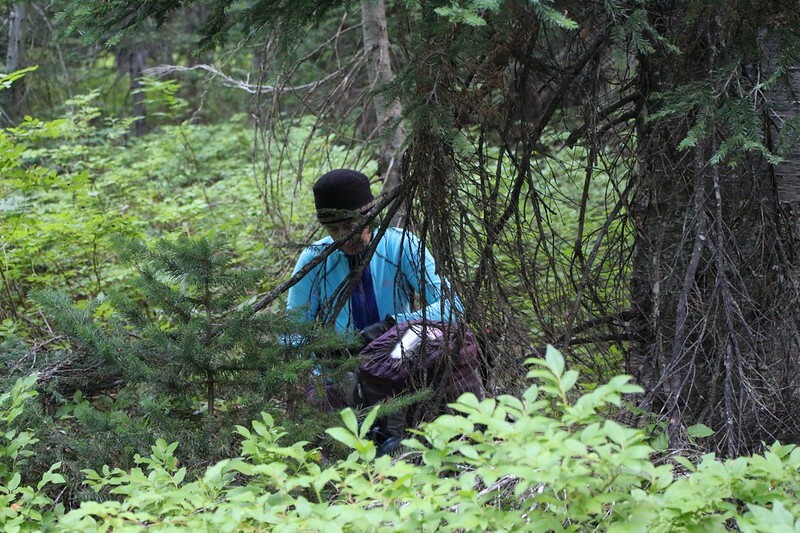 In fact, it cooled her off well enough that she was able to keep on hiking without suffering from overheating. That’s the tool she needed since her own body refused to sweat on its own; her personal thermostat was broken, and no one knew how to fix it, so this was our workaround. Three miles or so up the trail we came upon the newly-broken bridge across the Chiwawa River. 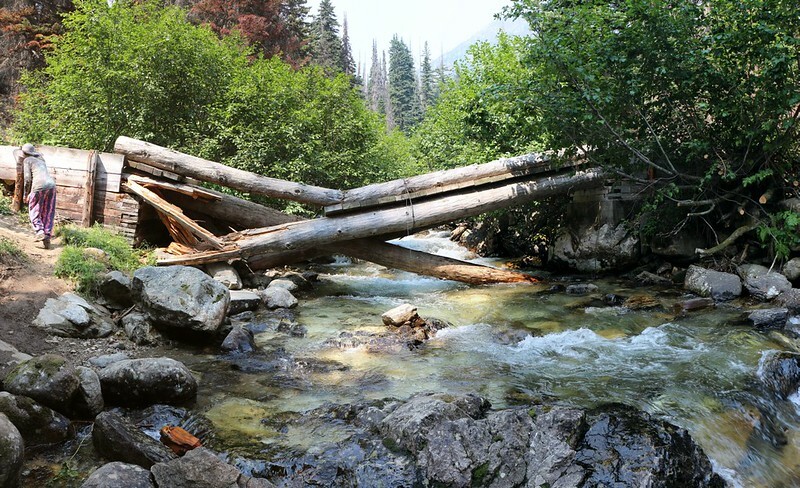 We had read reports online about this bridge indicating that it was fairly easy to cross, but there had also been a severely-worded note at the trailhead warning everyone about how dangerous it was. We believed the online people much more than the author of the note (that’s why we were hiking here at all) and they turned out to be correct. It was quite solid and easy to cross, even though it was obviously broken. This crossing was anticipated to be the most high-drama section of the day’s hike, and it was lot less dramatic than that note had led us to believe. 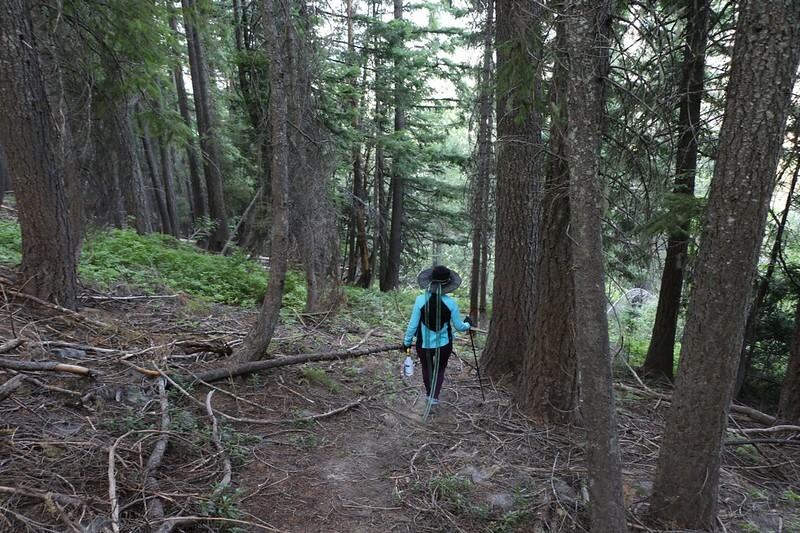 After taking a break at the river, we continued hiking within the perimeter of last year’s Buck Creek Fire. And it wasn’t a pretty sight. There were dead trees everywhere, and in many places even the old roots and pine needles in the soil had burned completely. 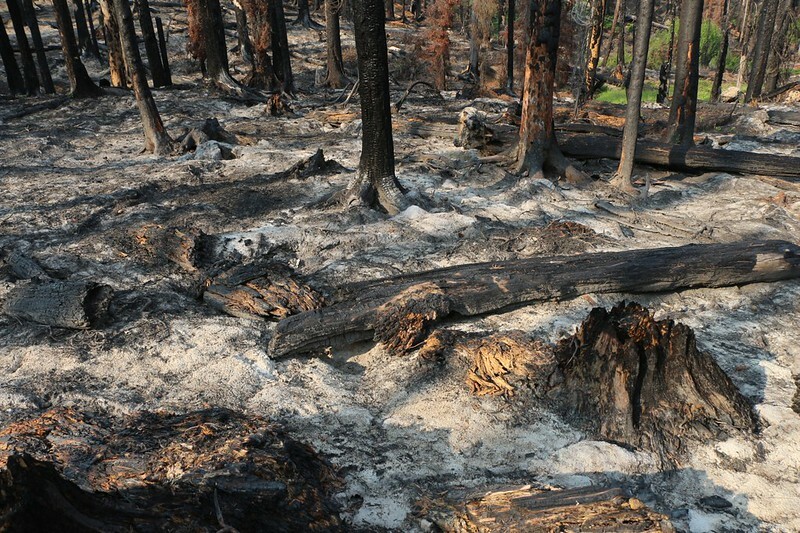 Other areas only burned lightly, so that new low shrubs had already regrown from their roots, leaving the forest floor green and lush. 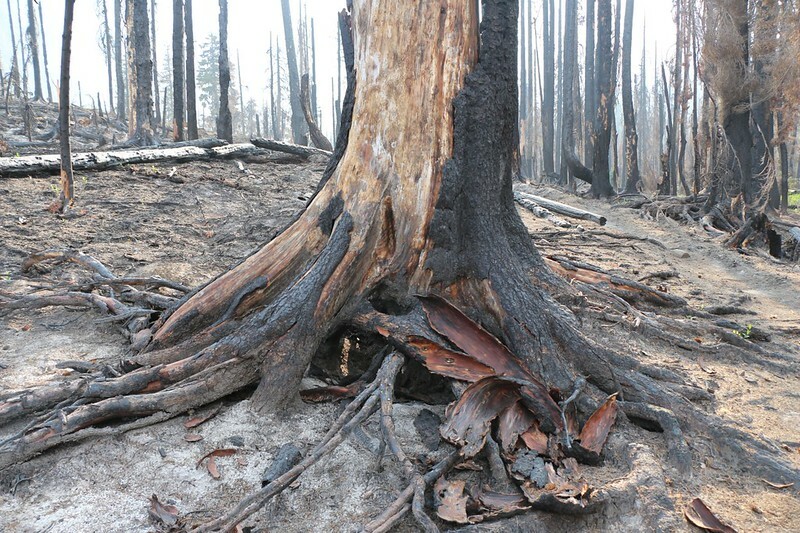 Some trees didn’t get burned at all, although those became more rare as we entered the heart of the burned zone. It was sad to see all the destruction, regardless of the fact that it was supposedly started by “natural” lightning. 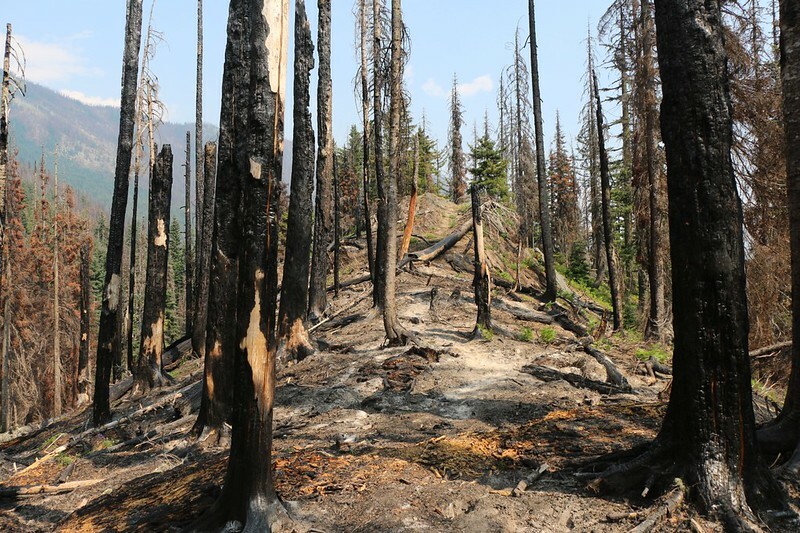 In fact, they purposely allowed this fire to burn without any intervention whatsoever, claiming that this would “enhance wilderness values and achieve resource benefits.” True! And there we were the following year to witness these so-called benefits: Several thousand acres of dead trees. Interestingly, if you or I were to break a living branch on purpose or take a single pine cone home with us then we could be punished and fined by these same authorities. Maybe we’re not “natural” enough to enhance wilderness values. We climbed and climbed along the trail through the zone of devastation. Eventually, we came upon a small ridge that stood up in the center of the valley. There were even a few unburnt trees on top. We climbed up and found a flat spot that would fit our tent, and also a nice patch of shade. It was still early, and we weren’t really sure if we wanted to camp there, but we stopped and took a long break in the shade just the same. It was terribly hot hiking in the sun. We spent several hours there, reading our books and eating some snacks. It was pleasant, and there was a bit of a breeze and a decent, albeit hazy, view of Buck Mountain to the west. Another problem we were having was the unbelievable quantity of Deer Flies that were present out here. As we hiked along we would collect swarms of them, and they would hitch rides on our backpacks and hats, or simply trail along in our slipstreams behind us. It was only when we stopped that they were completely and utterly in our faces. Totally one hundred percent annoying! We tried spraying DEET on ourselves but it only prevented them from landing quite as often. They still buzzed all around your face. Vicki discovered that they loved the bare skin of her legs and arms, and also that they would take a bite out of you every so often. Ouch! Vicki ended up putting on a long shirt and pants to stop them (I always wear long clothing) and it worked OK, but it also made her overheat more than ever. Even the water squirter had trouble cooling her off through a layer of clothing, although it was better than nothing. Deer Flies. We hate them forever! As the afternoon waned and the temperature dropped, we decided to take a short hike without backpacks, up the trail to see if there was a better spot nearby, possibly near the creek or to a place that wasn’t surrounded by burnt trees. But it wasn’t meant to be. We turned around when the trail began climbing steeply again. We had no interest in carrying our heavy packs much further uphill today. 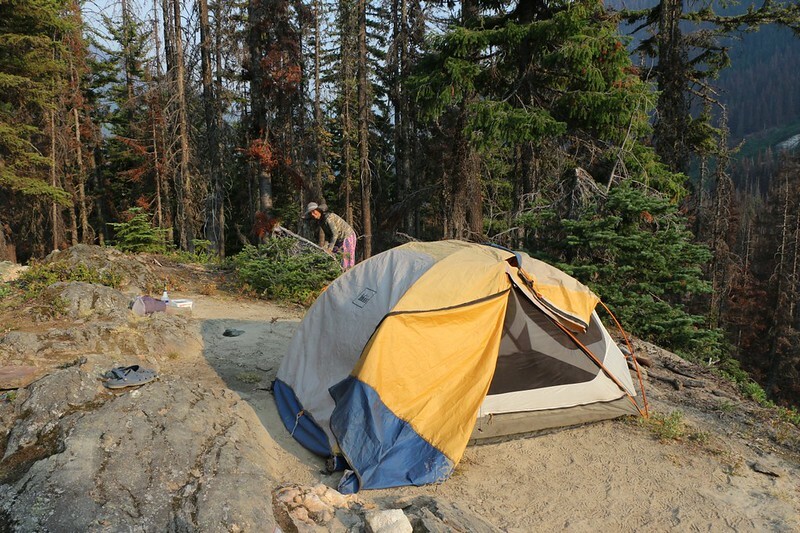 So we went back to our homely ridge and set up the tent. There was a small stream nearby that we filtered for drinking water. Then we made dinner and read our books while eating. It was quite peaceful. Thanks to the forecast of continued high temps, plus the fact that we had 2,000 feet to climb tomorrow, we decided to hit the sack early and wake up an hour before dawn, so as to get in some serious hiking before the sun got too high. Lying in bed, we discussed our day. The pines and streams and flowers and berries had been excellent, but the burnt trees and the heat and the haze and the flies had been horrible. We decided that Washington wasn’t being very nice to us so far. But it wasn’t exactly throwing us out, either. We’d give it another day, another opportunity to live up to its reputation. We knew full well that this was the boring and ugly part of our trip, so we’d cut Washington some slack. For now.